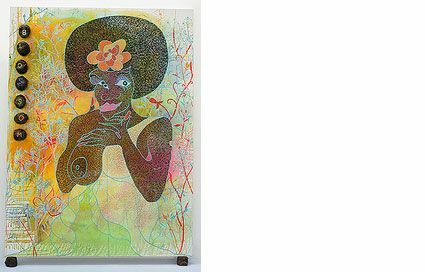 Chris Ofili's intensely coloured and intricately ornamented paintings are on show at Tate Britain in a major survey of the artist's career that brings together over 45 paintings, as well as pencil drawings and watercolours from the mid 1990s to today. One of the most acclaimed British painters of his generation, Ofili won the Turner Prize in 1998 and represented Great Britain at the 50th Venice Biennale in 2003. Ofili has built an international reputation with his works that bridge the sacred and the profane, popular culture and beliefs. His exuberant paintings are renowned for their rich layering and inventive use of media, including balls of elephant dung that punctuate the canvas and support them at their base, as well as glitter, resin, map pins and magazine cut-outs. Ofili's early works draw on a wide range of influences, from Zimbabwean cave painting to blaxploitation movies, fusing comic book heroes and icons of funk and hip-hop. For the first time, these celebrated paintings are presented alongside current developments in his practice following his move to Trinidad in 2005. While adopting a simplified colour palette and pared-down forms, his recent works continue to draw on diverse sources of inspiration, and are full of references to sensual and Biblical themes as well as explore Trinidad's landscape and mythology. Definite highlights include No Woman, No Cry, 1998, a tender portrait of a weeping female figure created in the aftermath of the Stephen Lawrence inquiry and The Upper Room 19992002, a darkened, walnut-panelled room containing thirteen canvases depicting rhesus macaque monkeys. Each is differentiated in bold colours, and individually spot-lit.